We know you’ve seen them: the big foam gliders that are a summertime staple of seemingly every big box retailer and dollar store in the world. They may be made by different companies or have slight cosmetic differences, but they all adhere to the basic formula: a long plastic bag containing the single-piece fuselage and two removable wings and a tail. Rip open the bag, jam the wings into the fuselage, and go see if you can’t get that thing stuck on a roof someplace. But after you toss it around a few times, things start to get a little stale. Those of us in the Hackaday Collective who still retain memories of our childhood may even recall attempting to augment the glider with some strategically attached bottle rockets. But [Timothy Wright] has done considerably better than that. 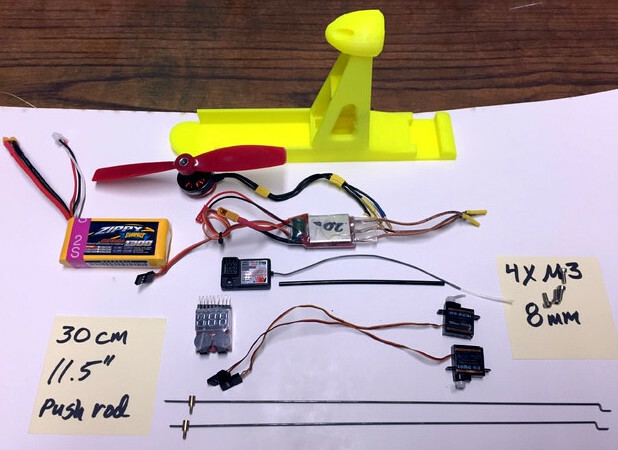 With the addition of a 3D printed “backpack”, he managed to add not only a motor to one of these foam fliers but an RC receiver and servos to move the control surfaces. The end result is a cheap and surprisingly capable RC plane with relatively little work required. [Timothy] certainly isn’t claiming to be the first person to slap a motor on a foam glider to wring a bit more fun out of it, but his approach is very slick and of course has the added bonus of being available for other grownup kids to try thanks to the Creative Commons license he released the designs under. He mentions that variations in the different gliders might cause some compatibility issues, but with the generous application of some zip ties and tape, it should be good to go. This particular hunk of foam might not set any altitude or distance records, and it certainly won’t be carrying you aloft, but it’s a pretty approachable summer project if you’ve got some RC gear laying around. Gen. Robert H. Barrow, USMC, once said that “Amateurs talk about tactics, but professionals study logistics.” That’s true in many enterprises, but in warfare, the side that neglects logistics is likely to be the loser. Keeping soldiers fed, clothed, and armed is the very essence of effectively prosecuting a war, and the long logistical chain from rear supply depots to forward action is what makes that possible. Armies have had millennia to optimize logistics, and they have always maximized use of new technologies to position supplies where they’re needed. Strong backs of men and beasts sufficed for centuries, supplemented by trains in the 19th century and supplanted by motor vehicles in the 20th. Later, aircraft made an incalculable impact on supply chains, allowing rapid mobilization of supplies and supporting the industrial scale death and destruction of the 20th-century’s wars.